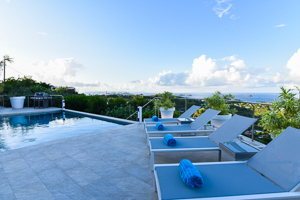 Villa UJV 168, also known as Villa Au Coeur du Rocher, has two bedrooms, two bathrooms and a heated pool. This comfortable villa is located in Vitet, offering a magnificent view over the ocean and landscape. The spacious living room opens onto the terrace, pool and view. It is furnished with comfortable white sofas. The modern, well-equipped kitchen is located just behind the living room. The dining room is located on the covered terrace nearby the pool. The master bedroom is connected to the living room and offers nice ocean views. The second bedroom, located downstairs, has its own bathroom, private terrace and independent entrance. They both offer comfortably designed furniture and modern amenities. The pool, with its surrounding terrace, is well exposed to enjoy the sun. The terrace is also blessed with a nice ocean breeze. Villa UJV 168 is a perfect choice for couples or friends who are seeking for privacy and quiet.